We’ve only had one exhibition criterium in Adelaide but already some sharp eyes have seen that some riders are using more narrow handlebars, a trend that’s probably coming to a ride near you. The humble handlebar has not changed much over the years. Carbon is replacing allow but the shape remains, indeed the UCI rules specify the “traditional” shape. Instead width and rider position and rider position are changing. That’s Lotto-Belisol’s Adam Hansen riding on bars that are 38 centimetres wide. You can measure width differently but 38 is narrow, what you’d expect on a small climber, especially as Hansen is a big rider with broad shoulders. As a rule, they say bars should be as wide as your shoulders. Hansen looks like a rider who’d take 42 or even 44cm bars. The idea is that keeping your arms straight is efficient and helps keep the chest open for breathing. But, as any glance at a time trial bike shows, moving the arms in can improve air flow. As you can see with the zoom below the bars are narrower than Hansen’s shoulders. By comparison, Team Sky’s Bernhard Eisel uses bars similar to shoulder width (note he’s turning and the bike is leaning, that’s why his shoulders are offset). See the DJ Connel blog for another image to view Hansen’s bar size. Moving from 42cm to 38cm is a marginal gain which counts for someone like Adam Hansen whose job involves pulling at 60km/h an hour in the finale of a race when every watt counts. It’s the same with track racers, for example we’ve seen track sprint champion Chris Hoy adopt very narrow bars. And bike design expert Gerard Vroomen has expressed a personal preference for narrow bars too. 42cm to 38cm is incremental, not radical, a 10% reduction. And it’s one thing to change the bar width but another to change position. You could simply twist your wrists but leave your elbows pointing out, letting the air flow into your chest rather than around, reducing any gains. Urban messengers and their fakenger cousins have long known about narrow bars letting you squeeze in between traffic, even cutting their bars shorter than the width of their hips. There’s a benefit in racing too as riders can get into smaller gaps with narrower bars, something that matters for sprint trains. However high speed stability and control can be sacrificed. I’ve not tested this but instinctively this feels like a “reduce to the absurd” argument, a messenger will notice it but go from 42cm to 38cm and you won’t notice much. Does it work? Well it helps but short of measuring these things independently fans and consumers are left with the sell-side claims of manufacturers. Toying with bar width is not new. I can remember the late Frank Vandenbroucke experimenting and Chris Boardman used narrow bars for his hour record. Go back further and you’ll find more examples. A marginal gain. This can help with aerodynamics and it’s also useful for riders trying to get into a gap. But changing the bar width is necessary but not sufficient to improve aerodynamics as the arms need to move inwards too, the position has to improve. Adam Hansen’s the case study and with André Greipel winning, there’s a bright spotlight on him. But others in the pro peloton are looking at this although it goes without saying most aren’t in a hurry to change. Still this is a low cost gain compared to aero wheels or a new frame so on’t be surprised to see this on a ride or in a race near you too. I’m surprised smooth helmets didn’t become commonplace in the pro peloton a long time ago. I’m undoubtedly showing my inexperience here(!) but the first time they came to my attention was all the stick Cav got for his helmet in the 2011 road race World Championship. Manufacturers move heaven and earth to make bikes more aerodynamic and then a rider goes and sticks a big lump of polystyrene with a load of scoops on his head and points it headlong into the wind all day! I know the extra ventilation probably far outweighs the aero benefits for a climber, but for a domestique who’s riding on the front all day long, it’s a no-brainer surely?! And lids with scoops are pretty? Never mind pretty, they’re dumb. What’s the point of the vestigial ribbing, when all the vents between are covered up? Why aren’t they smooth, like time-trial helmets? I was involved with some testing on body core temperature and it’s effects on time trial performance, and how head-cooling fed into all of that, about 5 or 6 years ago at the Human Performance Lab in Birmingham University. Given that 20-40 percent of body heat loss is cranial, ventilating the helmet to allow more efficioent heat loss would, the research seemed to indicate, benefit more in some circumstances, than having a more aero lid … but the findings came with the usual “more research needed” caveat of course. This is an old anecdote. Heat loss is directly related to only two things: surface area and proximity to major arteries (hence why your crotch on underarms tend to feel warm). Heat loss or gain through the head is inhibited by the presence of the skull so it is fully controlled by surface area and in general the head has about 9-10% of body surface area. As a result, the feeling of heat convection from the head does not correlate with actual convection (ie: it feels like more is happening than is). In other words, your head feels hotter with no vents but overall body temperature change is not affected significantly. Airflow over the body trumps everything else. So, the aero gains of smooth helmets greatly outweigh the power loss due to a minor drop in heat loss through the head. Even IF you are right about overall heat loss, given that the brain is in there, a 1 deg C increase in brain/head temp would surely be negative (if not detrimental) to performance and health. I for one sweat a lot generally, and if it wasn’t for the evaporative process on a summer day through the helmet, my head temp would undoubtedly be higher. Moreover, the body might pump more sweat out of the head trying to get additional cooling when a closed helmet is used, exacerbating the problem with faster fluid loss. Your own statements confirm all this; “your head feels hotter…but overall body temp change is not affected significantly. Airflow over body trumps everything else.” Really? You don’t think cooking your brain during a couple of hours is no big deal? It makes sense for short track events, but road racing on a hot day like that sounds like suicide (literally!). @ Craig – yeah, but …. in my own experience, having ridden TTs at national level and all distances from 5k to 12 hours and both indoors and on the road – the accumulated discomfort that goes along with having a head that “feels” hot is just one more thing to overcome. Given that your post dealt with head protection, I thought your climactic ‘..no-brainer surely? !’ was worthy of more love. It seemed to have whooshed over most crania. And what about the chromium plating? I thought the uci didn’t like shoe covers either? Or is that only on the track? For what it’s worth I really like narrow bars! Although when I changed them over it took some getting used to, now I would never go back. Shoe covers are banned… but nobody checked it seems. Shoe covers are banned only in track racing. uci did banned shoes covers. I am using a new shoe there and that is part of the shoe. The shoes will be released soon, something new and special. I’m guessing the chromium coating on the closed helmets is done to keep the rider’s head cool since the helmet itself has no vents now. Similar types of other manufacturers have been white and clear but chromium works like a mirror to keep the sun out. It could keep radiation down but given helmets are made of polystyrene which is an excellent insulator I think the mirror effect is designed to radiate publicity. That radiation argument would work both ways, no? Heat would also be leaving the rider’s head and trying to escape via radiation (and convection). I’m imagining a foil rescue blanket. Shoe covers, yes, they were banned a few years back, right? Henderson(? ), in the red shoes, looks to have even narrower bars. He is a smaller guy but, proportionally, they still look to be as narrow, if not more than Hansen. I’d love to see an interview with Hansen about this. In the argey-bargey world of sprints I can see narrow bars helping psychologically, giving a rider a sense that YES, that can make that gap at speed. A few spots picked up through aggressive positioning also seems more important to finishing well than the nominal aerodynamic advantage. But that’s just speculation on my part with no data to back it up. I don’t know where you see the integrated brakes on Hansen’s bike in that photo. Greipel and Henderson have them tough. You mentioned it in the 5 points : “Hansen’s not using it but the team’s Ridley Noah frame and forks have an integrated brake system which helps reduce drag” so no nitpicking necessary !! If you look at Bernard Eisel’s wrists, they look angled. But Hansen’s don’t. (I thought at first you were talking about the Lotto rider on the far right, whose handlebars look narrow, too.) I wonder if the angling doesn’t get uncomfortable with wider bars? I think another reason that riders are going with narrower bars is that it allows them to run a lower front end over all. All things being equal, a wider bar will position the rider’s chest lower than a narrower bar which through the shoulders will push the torso up a bit. If you lower the front end and go to narrower bars, you can achieve the same hip angle while decreasing spacer height and narrowing your profile to the wind. I’m assuming Hansen went for maximum gains over comfort for a 1 hour flat race that was almost certain to end in a sprint. It’s unlikely that he would wear a skin suit for a longer race and would probably have wider handlebars too. Also, I don’t think this was an official UCI race, therefore the rules on shoe covers probably don’t apply. Guess we’ll find out soon what he picks for the longer races. Good point on the non-official race. As for the duration of the race, note he used them in the Australian national championships the other day, a five hour race. See the DJ Connel blog link above for pictures of him in this race with the same bars. So this criterium was a non-sanctioned event? I though the UCI rule 1.2.019 says the pros aren’t allowed to participate in non-UCI events under the threat of 50-100 Swiss francs and a one month suspension. The whole bay crit series is a non-UCI event, they just turn a blind eye to the PROs who race there. I went to check and the Adelaide race is on the UCI’s criterium calendar. So not World Tour but certainly under UCI rules. Agreed that the length of this prologue (in all but name) was crucial. Time-trial length, and similar style of changes. Let’s see what he’s riding on Tuesday! I really should read the other replies first! As far as I could see Hansen rode the 38cm bars through all 3 GTs last year. I remember some mention of it on Aust TV during the Giro and kept an eye out during the season. Seems he’s more than used to them now and he’s certainly doing something right in the Greipel train! my gratitude to this blog – among the best thing on the internet theese days – yo! I would’ve thought that the most important width is that of the humerus heads when in the riding position. The ‘width of the shoulders’ is such a vague term that it could be anything. Just look at the difference in musculature between Hansen and Wellens. Especially the deltoids and triceps. Also notice how bernie has rolled his wrists in such that he can get his shoulders, elbows, and wrists aligned. Yes more precisely it’s the humerus. “Shoulders” is vague but I suppose so is the rule of thumb. The same for bar measurement , c-c vs outside to outside and that’s before you measure at different points, eg the brake hoods vs the ends of the drops. Back in the day, we rode narrower bars on the track so that we could stick them in narrower spaces between riders in the pack. Also, they were easier to protect from getting hooked or banged around by others. Could be a rational for pilot fish and road sprinters as well. Haha, nice one! I’d say they look better than the mandatory yellow helmets in the tour de France but still not very elegant. I’m very much loving the Roads to ride serie btw. Solid work, again! Thanks for that link to the urban dictionary, wish I had found it when I was still working with so many colleagues much younger than myself, it would have been very useful. For some time now I have used a compact bar with less forward throw (short body/arms) and a tight bend on the tops to allow hands to be further apart on the tops, all about comfort, width 42cm I sometimes wonder if the marginal gains thing is about mind games. Zach you beat me to it. Agree wider bars give more leverage is a sprint so you can get more of a jump. Try sprinting with hands on the tops… Terrible. I’m a (wannabe) sprinter and changed from 40cm to 33cm bars a year ago. The handling felt weird at first, but after a few rides i loved them. What it does, is that the narrower bar is forcing your elbows out and that makes your upper body stronger and more stable. This is a lot of comments about bar width…………….. 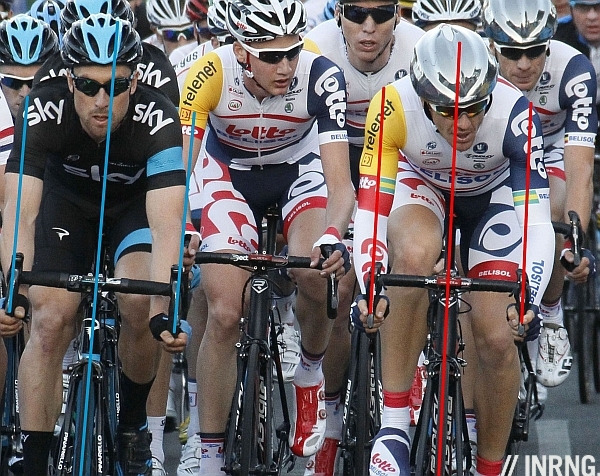 Narrow bars might have their benefits aerodynamically, but I’d put $5 on Hansen going back to 44cm bars by mid year. A rider might be able to get used to the handling, but I imagine that over time the poor alignment will eventually stuff up shoulder biomechanics. Just think of what will be happening to his poor rhomboids and serratus anterior. Actually he has been on the for a while now… so maybe I will have that $5! Yikes, I am quite surprised by that, Glad I didnt go betting more. @Toby, I’ll go out of my way to buy the next edition of RIDE ok? The inner osteopath in me is squirming as such a setup, it sounds like “fast track to upper crossed problems”. But if you can ride with it, I suppose it makes sense. I was amazed to read Gerard Vroomens thoughts on narrow handlebars, aerodynamics etc. That view significantly clashes with his previous blog statements about head tube height not mattering and that riders may as well sit up nice and high. I dont have an engineering background, but I struggle to see how sitting up high can help one’s aerodynamics. I can’t speak for Gerard Vroomen but I think his point is about elbows. See how many riders have a big height gap between the bars and the seat today compared to past riders like, say, Francesco Moser who could with a very aero position but with the bars higher, they bent their elbows. I was going to mention this in the piece above as a second observation on rider position but deleted it as it confused the story above. It’ll put it in another day soon. Good idea. That article sounds great. An obvious example would be the difference in TT position between Cadel Evans and Bradley Wiggins. Cadel having crazy low bars but a kyphotic position and Wiggins having fairly high bars yet a horizontal back. I have tested 40 cm vs 35 cm in the wind tunnel (with rider) and the difference is very meaningful. When it comes to handling, I would say that having now raced on 35’s for two seasons, I would not go back to wide. They are stable in sprints and overall much more comfortable (to me.) The fastest sprinters in the world have all gone narrow and they would not if there was a lack of stability. It is also the trend on TT bikes for the base bars. I expect that in a few years we will not be able to find TT base bars that are wider than 40 with 36-38 being the norm. They key is alignment and with the new lever shapes and slight bar shape changes, one can align their wrists to be comfortable. Then aero trumps. The stability thing is a red herring … I am sure there is a width that is too narrow but if the rider is balanced it isn’t 38cm. With the “new normal” position moving the riders further forward than the “Hinault days”, narrower actually makes more sense in a lot of ways. For seated climbers, probably not as much. The mention of the skinsuit made me notice Hansen has Aust Champ bands on his sleeves, but he’s never been Aust Road (or Criterium) champion. Seems Lotto have only given him a “time trail” skinsuit. He might need another one – sans bands – if he’s gonna keep wearing them in road races? Yep, he’s won the national ITT, but ‘only’ (?) placed 2nd twice and 3rd in the national road race. He’s hardly the type to have requested them, blame the team for that one. 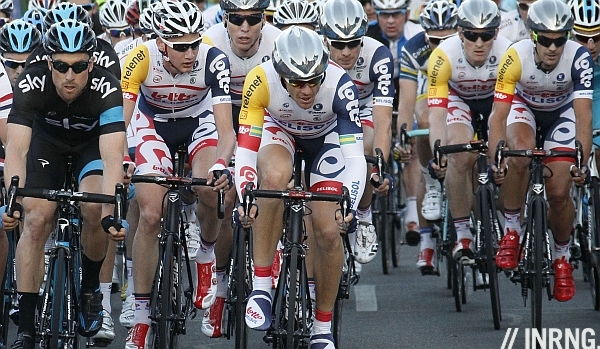 We need a study on a benefits of stylish kit because Rapha and Team Sky definately beat Lotto-Belisol in that photo. Try to imagine the Sky kit with a few more colorful sponsor logos… There you go. Sky pays big so they can have a plain jersey. That would be c-c measurements? Unless Deda makes a special super narrow bar for Henderson he’s on exactly the same bars as my wife, RHM01 38cm o-o. Indeed. Greg Hendersen from Lotto has been rocking narrower width handlebars for a while now too, perhaps a new way or thinking at Lotto? Personally by default I have been a size down on one of my bikes, I love it, the only problem is, as you say ‘bike handling’ at speed and cornering. One thing, you have greater grip and control over the front end of the bike in a sprint. The narrower bars may be stiffer too since the tube length is reduced, less flex. Sitting in traffic after the (Australian) nationals, we were stuck next to Adam Hansen as he was standing behind his Mum & Dad’s car. A long way from the Cav with his many personal fluffers, Adam just packed up his stuff while his old man helped pack the gear into the boot like he was a 15 year old kid at the local crits. He had been one of the animators of the race an hour before, really putting some serious attacks in, but here he was, clearly just focussed on the ride. On the main issue, the kit, no one can seriously say black socks on the Rapha kit is ok? Bernie looks like the kid at school forced to play footy in his school socks…Lance used to wear grey socks remember too…I knew there was something bad about him. All that said, I like my bars fully licensed and rocking ! A lot of skinsuits out and about at TDU today it seems. I’ll be interested to see if they keep them on, it’s forecast to hit 37 in Adelaide on Thursday. skinsuits for stages that are sprinter oriented only I’d say. I recall Jason Queally also used very narrow standard bars for track kilo (instead of aero bars). If you are going to go narrow for aero gain, why not also use one of the available bars with the tops that are more aero shaped? As for other equipment, I saw yesterday a quote for the UK Sport’s BC track bikes (which took 3 months to arrive). “Commercially available” is stretching it just a little when one could buy a house for the same money. Yep, let’s sort out the big issues like the banning of shoe covers. I am sure I have read an article about narrow bars generating forward thrust better on the track, it had a pretty diagram and everything. Can’t for the life of me find it now. I guess the same would hold true in a road sprint and couple with the marginal gains of watts/cm saving? If the guy thinks narrow bars make him faster they probably do, no matter what the reality might be. Same as when Willy Voet shot up Virenque with the salt water instead of the super dope he’d bought. I know one thing, riding bars narrower than your shoulder width is not big deal but vice-versa is HORRIBLE! I bought a set of 44’s on sale once and my shoulders hurt like hell…took awhile to figure it out and go back to 42. Our smaller rental bikes have 40’s on ’em and I’m riding one in Sicily now with no problems. Rode the same bike down here last year as well as on our Legendary Climbs tour with no ill-effects. If I had to replace the bars on my personal bike fleet right now 40’s might get the nod vs 42’s, but you couldn’t pay me to ride with 44’s or larger ever again! There’s a name missing from this discussion. Shane Perkins has played a big part in a narrow bar revolution. RIDE Cycling Review published a column by him in which he explains that he took inspiration from riders on the Japanese keirin circuit and decided to go narrow based on what he saw. When I’m back in the office (ie. after TDU), I’ll be sure to find the piece and publish it on our site. In the meantime I saw Adam Hansen in the lift earlier today and we have arranged to meet tomorrow, so it’s great to have all this as a discussion point in an interview that could include many other equipment discussions with a rider who takes everything into consideration. Thanks to inrng for raising the topic of conversation. Consider the nature of how your interaction with the bike with your arms is, and then decrease that leverage and the whole machine responds differently. Perkins and Hoy swapped to smaller bars around the same time. I think Shane said he even had gone to narrow handlebars before Sir Chris did. There have been many modifications since the adaptation of this trend by manufacturers but they have largely been for track-specific bikes. Now, however, there are options and I’ll be sure to find out from Adam and Greg Henderson how they’ve acquired their current set-up and what inspired it. Can’t wait Rob, be interested to read. Could you ask how they find the ridability of the bike such handling, cornering etc. outside of a leadout and sprint. Sharp/tight turns, elbows, positioning on the track is one thing, descending mountains at high speed into tight corners is another. Would they change up widths for non-sprint stages? Hey guys, regarding the Chrome Aeroshell. Just as aerodynamic as the smooth Aeroshell debuted at the 2012 Tour de France, the Chrome Aeroshell is designed to reflect solar radiation. Experiments at EMPA (Swiss Federal Laboratories for Materials Science and Technology, project number 209541) have shown that the material reflects about 55% of the incoming solar radiation (visible light + infrared) compared to a reflection of 20% of standard helmet material. The use of the Chrome Aeroshell results in reduced heat accumulation between head and helmet which helps keep the head cool and comfortable. It allows for zero UV penetration into the helmet for protection again the damaging rays of the sun. The thermal effects on the head when wearing a helmet with a Chrome Aeroshell will be extensively tested in the coming months. What about the reduction in cooling due to the lack of airflow vents on top? I would assume the heat loss through the head is much greater than irradiation from the sun. Irony of seeing them in the TDU is AFAIK, they are not yet legally permitted for use by cyclists on Australian roads (where wearing cycling helmets while riding is compulsory nationwide and helmets must be certified to the ASA standards). For some reason Aussie heads require a different standard than Euros or North Americans. Yeah right. Try wearing a no-vent helmet in 40C Australian sun. Or in Oman. No thanks. I’ve been fiddling with my own 44cm handlebars for the last year or so. What’s not been mentioned is how the bars feel when you’re standing up climbing, holding on to the brake hoods. FSA bars are narrower at the brake hood curve than at the end of the drops. I wish the FSA bars were equal width (ie., wider) at the hoods. The narrower spacing feels nice seated, just riding along, but standing up for a steep pitch, I can’t yank on the bars as much as I can with wider Deda and Ritchey bars. I love the FSA bars, except for the narrower brake width. I think the bar width debate is interesting as bringing the hands in also fractionally shortens the reach, so taken to a logical conclusion with some of the uber-narrow widths discussed here, we might be looking at some interesting effects that are not *only* about leverage where handling is concerned … longer stem, less leverage … hmmmm, worthy of a bit of experimentation. re: covered helmets: things must change to remain the SALE (A new twist to an old saying). I can see the benefits to (some) racers vis-a-vis aero. I’ll keep my lightweight vented lids, thanx. But this will most certainly prompt the wannabe masses to throw their perfect working helmets out the window and flock to the shops for that ellusive 0.6 watt gain. Should be enough for the Wednesday Night Crit Championships win. Maybe aero wheels and frames are plateauing. Or maybe I’m too cynical. Probably both. re: narrow bars: comfort is the only measure for me (well not entirelly true, aesthetics matter a lot too lol). Independent testing has shown the Lazer Aeroshell allows the rider to save between 4 and 10 watts of energy when cycling at 45kph as compared to a Lazer Helium helmet without the Aeroshell. This aerodynamic effect allows the rider to achieve a performance benefit of between 12 and 30 seconds over 40 kilometers. But the real benefit for non-UCI racers is that the Aeroshell and be easily installed and removed from their standard Lazer helmet. Protection from the wind, rain, snow or to achieve the aerodynamic benefit is as easy as popping the Aeroshell on your Lazer! Boonen made a move from 46 to 44cm bars at the beginning of last year for aero reasons apparently. note…kiwi Greg Henderson is running 36cm handlebars…its all about perceived aero. Next post: Should the UCI have Disqualified Armstrong in 1999?